Battle your way to freedom as the green giant himself in this incredible adventure of a slot machine. Click here to play! Bruce Banner is long gone, and now your only hope is to defeat the evil army trying to destroy you. Make your way to freedom and you will be rewarded with massive cash jackpots. 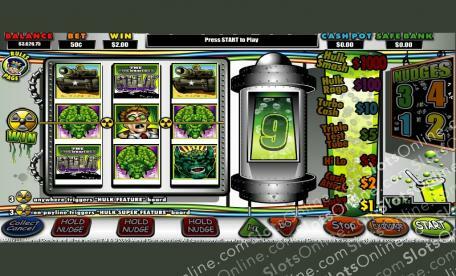 The Hulk is a fun slot based on the fruit machine style of gaming. When you spin up a winning combination, you may be awarded with Nudges, which allow you to move the reels, or Holds, which allow you to hold a particular reel for the next spin. Additionally, whenever you win, you will be given the option to collect your winnings or take a Hi/Lo gamble. There are two features that you can trigger: the first with the Hulk Feature, and the second with the Super Hulk Feature. The features can be quite lucrative, so read the rules page before playing! The Hulk Slot is three times the fun, with 50c, $1, and $5 variations, all available at the same casino. Start playing for some giant winnings today. There are two features that can be triggered called the Hulk Feature and Super Hulk Feature. These will send you into a game room where a number will be spun. You can win in this room or attempt to exchange it for something better by moving to another room and attempting to find three of a kind of the same symbol.